If you're a fan of Shaun of the Dead or Spaced, you're going to love Hot Fuzz, the new comedy from Simon Pegg and Edgar Wright. Come to think of it, if you're a fan of Miss Marple, Miami Vice, The Midsomer Murders, Point Break or The Vicar of Dibley you'll probably love it too. Oh hell, what's not to love about this hilarious, heart warming, all guns blazing, moderately violent slice of rural gothic? 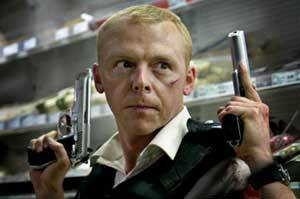 Simon Pegg plays Nicholas Angel, a London police constable so exceptionally good at his job he's banished to the countryside because he's making everyone else on the force (oh sorry, the service - force sounds too aggressive) look bad. And so he finds himself exiled to Sandford, a small town in Gloucestershire with a picture-perfect exterior that belies a heart of darkness, populated by a cast of British Equity stalwarts so parochially sinister they make the Stoneybridge Toon Cooncil look cosmopolitan and the inhabitants of Royston Vasey look, well, normal. Soon our gallant hero is up to his oxters in village fêtes, escaped farm animals, over zealous Neighbourhood Watch committees and murder most foul - and he's not about to get any help from the local yokels down the police station, who are too busy eating cake and drinking in the pub to care much about crime. As the plot thickens and the body count rises, Sergeant Angel and his trusty sidekick PC Danny Butterman (Nick Frost) must stand up for righteousness and the law - packing some serious hardware, of course. 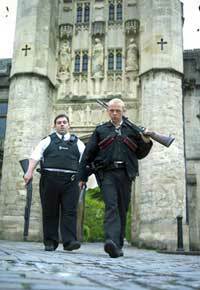 Like Shaun of the Dead, Hot Fuzz is a genre movie (this time replacing horror with action) that exploits its own clichés for maximum comic effect, while creating central characters that are rounded, engaging and utterly believable. For beneath the humour, the swear words and the gore (and some of the set pieces are pretty bloody, by the way) lies a touching tale of a lonely career obsessive whose entire life is devoted to being a police officer and whose best friend in the world is a Japanese peace lily, but who finally finds a new pal in the unlikely form of bumbling action movie addict Danny. Move over Crockett and Tubbs, and make room for the new buddy movie heroes: Crockett and Tubby. With some smashing cameos from the likes of Jim Broadbent, Bill Nighy, Bill Bailey, Steve Coogan, Edward Woodward (!) and Timothy Dalton (who really steals the show as sleazy, moustachioed, supermarket boss Simon Skinner, constantly accompanied by a Bond-esque background soundtrack) Hot Fuzz is a real who's who of home grown talent - what actor in the their right minds, after all, would turn down the chance to have this much fun? Cut together at a breakneck speed that's more Dawn of the Dead than Shaun, Hot Fuzz is fast, furious and super slick, like Guy Ritchie with garden parties. It's Heartbeat meets Point Break, Last of the Summer Wine meets Escape from New York, Bergerac meets Bad Boys - and it's very, very funny.